Carnival Fantasy may be the oldest vessel in the Carnival fleet, but it certainly has style, and a warm and friendly atmosphere. Despite some crowding, the ship is ideal for first-time cruisers as it provides a taste of what Carnival cruising can be like -- nonstop (often corny but fun) entertainment, over-the-top decor featuring Grecian and Egyptian statues, top-notch people-watching, ports of call with stunning blue waters (think Cancun, Cozumel and Progreso, Mexico) and more food than you could ever eat, from pizza to escargot. There's nightlife and daily interactive games, but also solitude if you prefer. The cabins are nicely decorated and exceedingly comfortable: the perfect place to get away from it all. Service is unbeatable. For a pair of first-time cruisers, Carnival Fantasy delivered on Carnival's promises of first-rate fun, most notably with its stellar staff. Each day offered new surprises, whether it was Champagne and chocolate-dipped strawberries delivered to our door one night or an "impromptu" performance of the song "Celebration," in the Grand Atrium on another, complete with dancing and Mardi Gras beads. Carnival Fantasy underwent a multimillion-dollar "Fun Ship 2.0" refurbishment in February 2016 that included the addition of several new dining and bar options, all on the Lido Deck. Many portions of the ship look dated, but not in a bad way. In a sense, Carnival Fantasy is a perfectly preserved time capsule. The bright colors and futuristic font of the signs for the shops and Universe Lounge, for example, as well as the geometric carpeting in the common areas, hearken to a 1980s mall. The Grand Atrium, the first area one sees when boarding, is reminiscent of a casino, with plenty of neon blue lights such as those outlining the large, glass, diamond-shaped elevators, which are the atrium's focal point and stay in high demand night and day. What was most remarkable about this cruise was the staff, who proved to be, in a word, awesome. Almost without exception, they demonstrated cheerful and caring attitudes. We were greeted with smiles daily, and dining, housekeeping and room-service workers remembered such details as where you were from, why you were on the cruise and whether you had been seasick the day before (Carnival reports this is rarely a problem and, indeed, veteran cruisers who are prone to seasickness came equipped with scopolamine patches, which they said worked wonders). More often than not, staff members called us by name. An added bonus is that out-of-town cruisers will find a Mobile ready and eager to welcome them back after not having a cruise ship for approximately five years. In late 2016, the city unveiled the long-awaited Mobile Mardi Gras Park, within walking distance of the terminal, and Dauphin Street, downtown's central thoroughfare, bustles with restaurants, boutiques and bars that hop at all hours of the day and night. 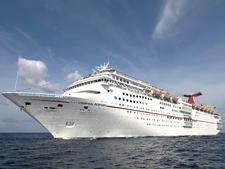 Several cruisers raved about package deals that include parking and hotel rooms. A typical Carnival Fantasy sailing has people of all ages, as well as quite a few families with babies and young children. On the opposite end of the spectrum, there are plenty of senior citizens, some happily traveling solo and some with their spouses, relatives or friends. Everyone is friendly and there's a feeling of "we're all in this together" camaraderie onboard. Everyone we encountered, whether passenger or crew member, was helpful and eager to share their stories of past cruises. Cruise Critic’s professional photographers and our extraordinary community members have taken 1,543 pictures of Carnival Fantasy. When you visit our photo galleries, you can be assured that what you see is what you get. The majority of the time, the dress code on Carnival Fantasy is Cruise Casual, which can pretty much be interpreted as dress however you feel. We saw passengers wearing everything from flip-flops and shorts over wet bathing suits to, on some ladies, 5-inch heels, glittery tops and jewelry, no matter the time of day or night. There is one Cruise Elegant night per trip on which passengers are expected to dress up for the four- and five-night cruises out of Mobile. Elegance is be interpreted in various ways, with men wearing everything from collared long-sleeve shirts with khakis to tuxes and women wearing everything from slacks with a dressy top to long, sequined evening gowns. (Tuxes and ball gowns were definitely in the minority, making up maybe 20 percent of the diners on Cruise Elegant night.) It's all up to you, and almost anything (except looking like a slob) goes. We're pretty sure you wouldn't get kicked out the dining room for refusing to dress up. Carnival recommends $12.95 per person, per day, for gratuities ($13.95 per person, per day for those in suites), including children. The guidelines allocate a portion to dining room and cabin crew, as well as other crew that include kitchen, entertainment, passenger services and other hotel services. A 15 percent gratuity for bar bills and spa treatments is automatically added to your shipboard account, but it can be adjusted in either direction at the Guest Services desk. As with all Carnival vessels, Carnival Fantasy is a cash-free ship, which means you need to provide a credit card number or pre-set amount of cash to receive a Sail & Sign card prior to boarding. Everything you buy onboard goes on the card and a tally of the damage is slipped under your door on the last day.